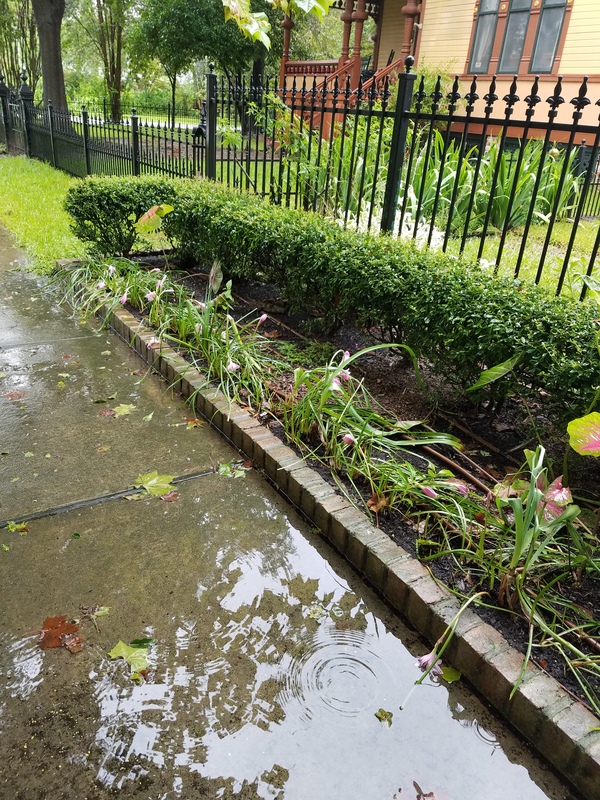 I am grateful to be on the other side of the deluge Harvey brought us. The restoration of the gulf coast will take time and money. Personally this experience has already restored my soul and my faith in humanity. People have been amazing. Help from everywhere! Literally jumping in and risking their lives to save others! I can’t really put in words the range of emotions I have experienced. Several days tears would overflow my own banks. It was comforting as the world pulled together and was pulling for us. Houston is enormous yet has such a small town feel. I live in The Heights about 3 miles from downtown. 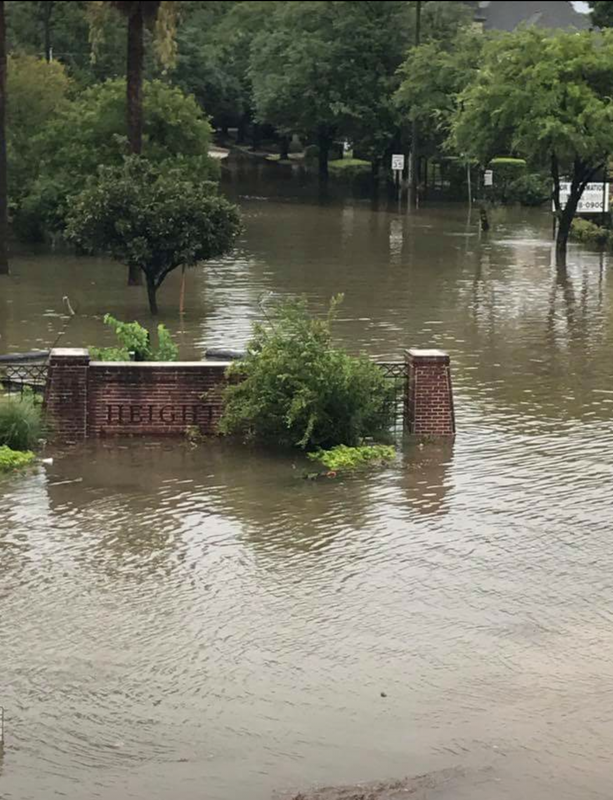 My neighborhood is 23 feet higher than downtown and we only had street and right of way flooding. The one thing we worried about was our trucks flooding. Kind neighbors let us share their driveways. As soon as possible local small businesses opened their doors to collect donations to take to shelters. 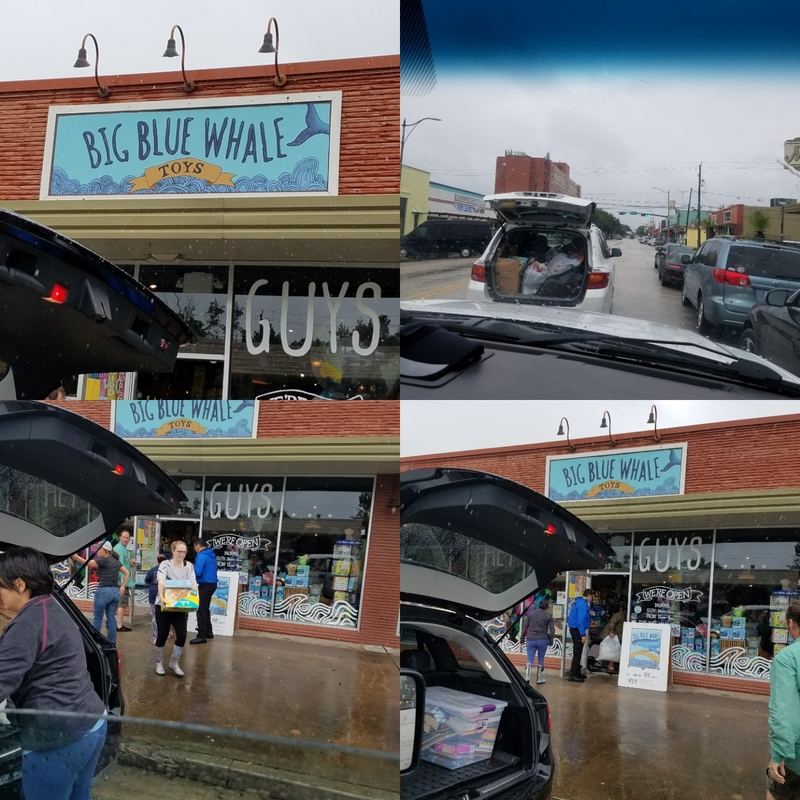 This is Big Blue Whale a lovely toy store here in the Heights. We helped them get some of the donations to shelters. Down House, a local cafe, was open and collecting donations; and when all the local shelters were full they took trucks to Refugio. The generous spirit that surrounds us is amazing! 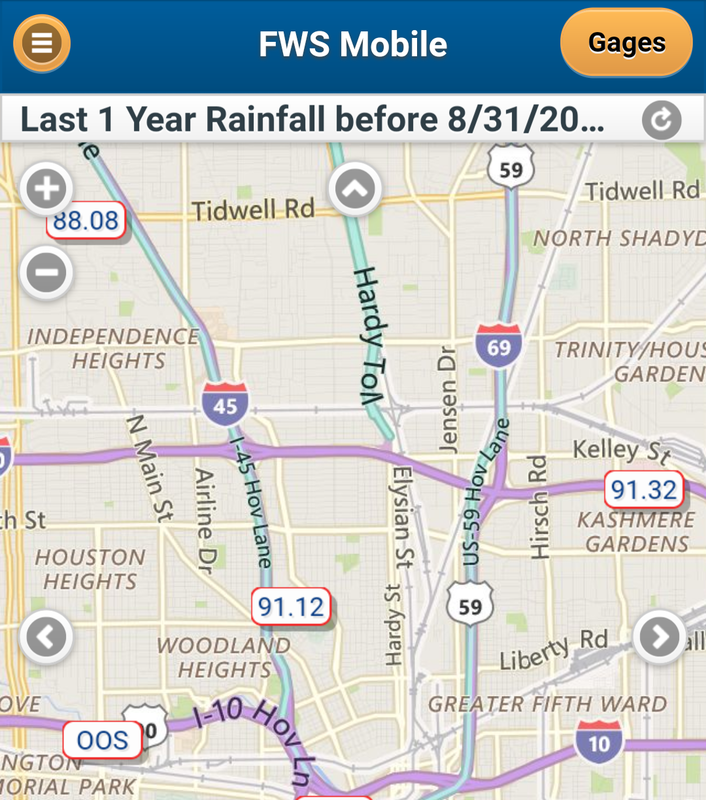 We live near White Oak bayou which crested its bank and came into the Heights. This is our entrance. You can’t see the garden that our local Heights Garden Club keeps beautiful. A recent photo! The water is down now but the pomegranate trees were stripped of their fruit and we will have to wait to see what else survives. Further along Waugh Drive is Buffalo Bayou, we were heading south, looking west on our way to George R. Brown Convention center to drop off donations. This is the bayou downstream from the reservoirs so still quite high until they can relieve all the pressure from the damns. That is said to take another 15 days. The bridge hosts a bat colony and we saw pictures of people rescuing some of the bats. Everyone suffers in a epic storm like this one. 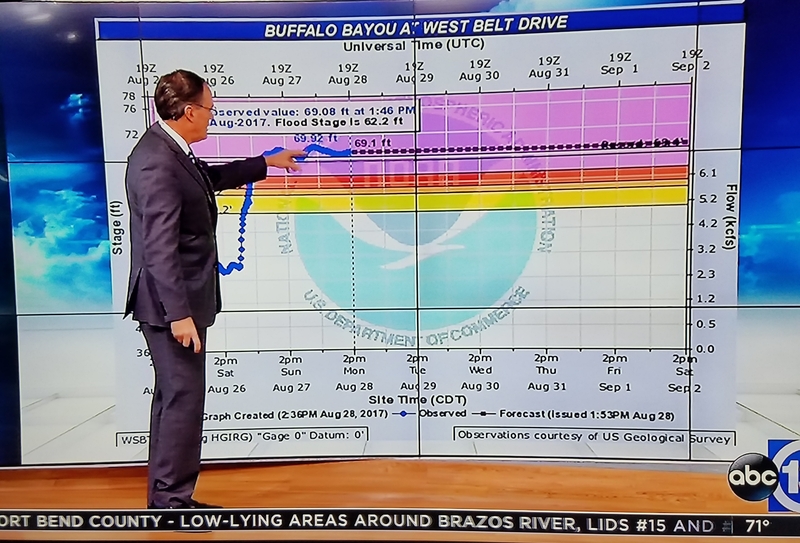 Here is a graph of the Bayou at record high during the storm. The first couple of days we were glued to the TV. The local reporting was excellent and it helped save lives. It was scary to see pictures like this knowing it was with in a few miles of our home! There are still places under water both north and south of us along the coast. Rain fall totals: It is hard to describe how it feels to receive 34+ inches of rain in a 4 day period. The skies were dark for days and it just rained and rained. Normal rainfall for a year is 50″. This is our total for the last 12 months. I check this site regularly. Owning a landscape design build company means you are at the mercy of the weather. Our view looking out from the porch. We are so very fortunate to live in this old house with it’s pier and beam construction. It is 112 years old and never flooded! I am so touched by all the folks that have reached out to check on us! All through the storm I had emails and messages on Facebook. I had lots of comments and encouraging words on my Instagram posts from people I have never met but connect with via pictures. I think it will take a long time to process all that we have been though and as Haruki Murakami says, we will never be the same. I know one thing, this shared experience has made my roots grow deep in this clay soil. Houston is finally home! P.S. Many have asked how they can help. There are many many people helping collect goods and money to help those that need it. One group that is always helping is the Houston Food Bank. You can be assured your money is used to feed the hungry! Glad to hear you guys are ok. Stay safe! Thank you Shawn! I see now that healing is going to take a long time. I’m so glad to see you posted this. I had been wondering but noticed you were active on facebook so you must be okay plus I knew you lived in the Heights which is pretty much what the name means. I grew up in the shadow of Addicks Reservoir, Bear Creek was our park and back then we could walk on top of the dam. Our house never flooded even when the neighbor’s did. I watched the coverage and the maps. It looks like the house that couldn’t flood finally did. 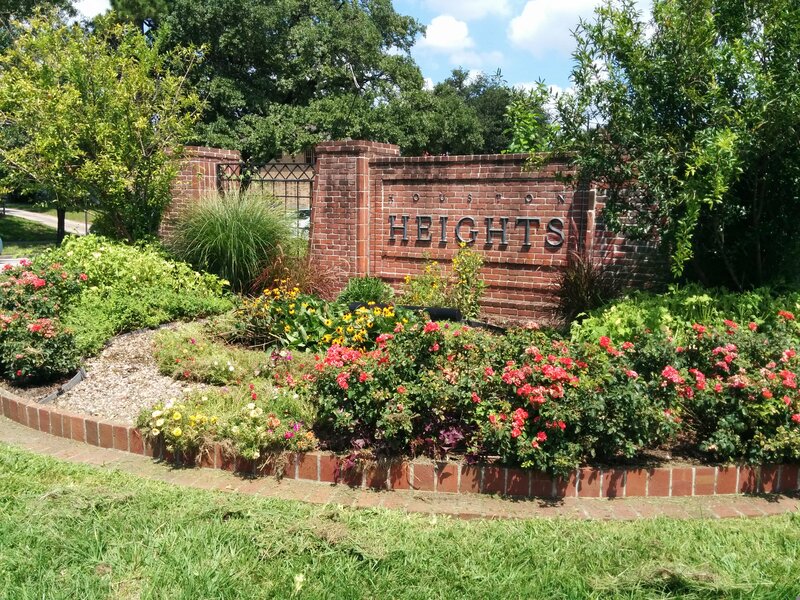 Yes…the Heights lived up to its name! The unprecedented amount of rain in such a short period was just too much for the reservoirs and so they crested. 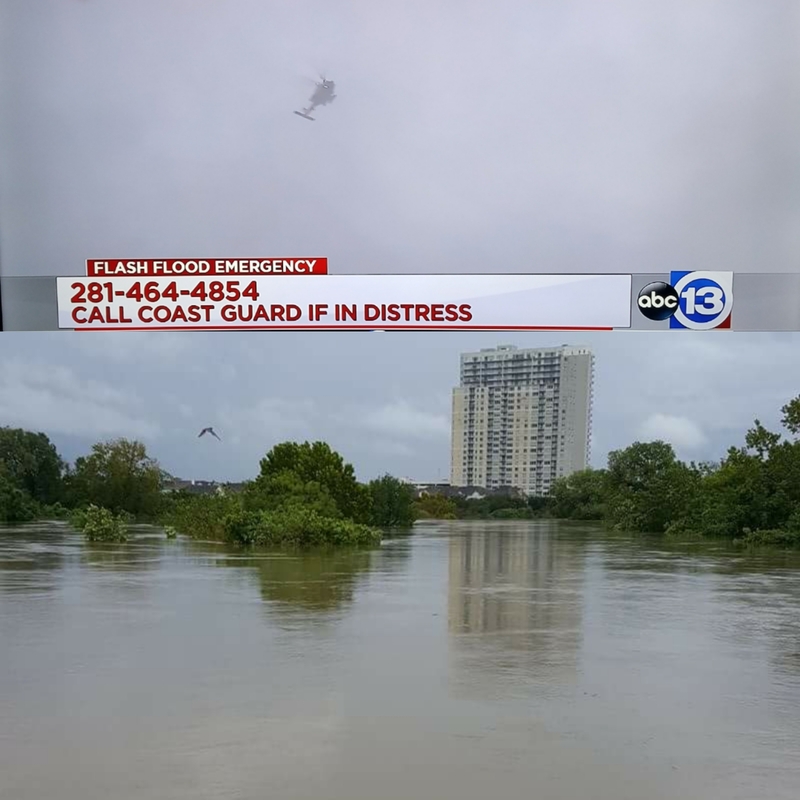 There are many homes that have never flooded until Harvey! Very sad! Thanks, Lauren, for this perspective. It’s a difficult time ahead for Houston, but resilience in face of tremendous damage — that’s a human perspective. Thank you Lisa, knowing people have gathered and are pulling for the gulf coast really helps! 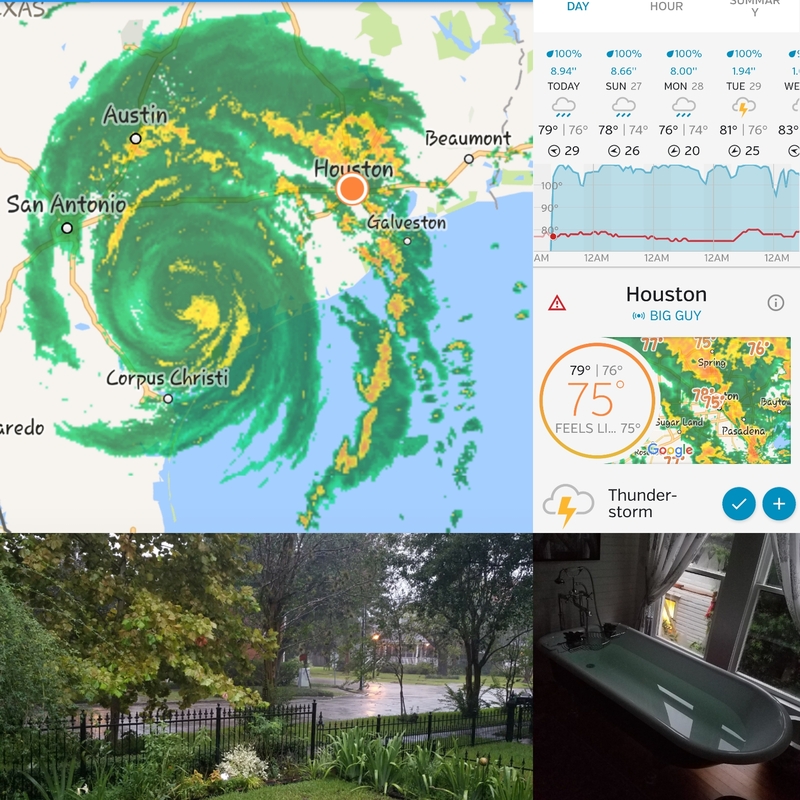 Thanks for the report, and your rain puts anything called “extreme” here into perspective. 90″+/- of rain in 8 months of 2017 so far…even your average of 50″ is wild. It is incomprehensible even when you are in it! 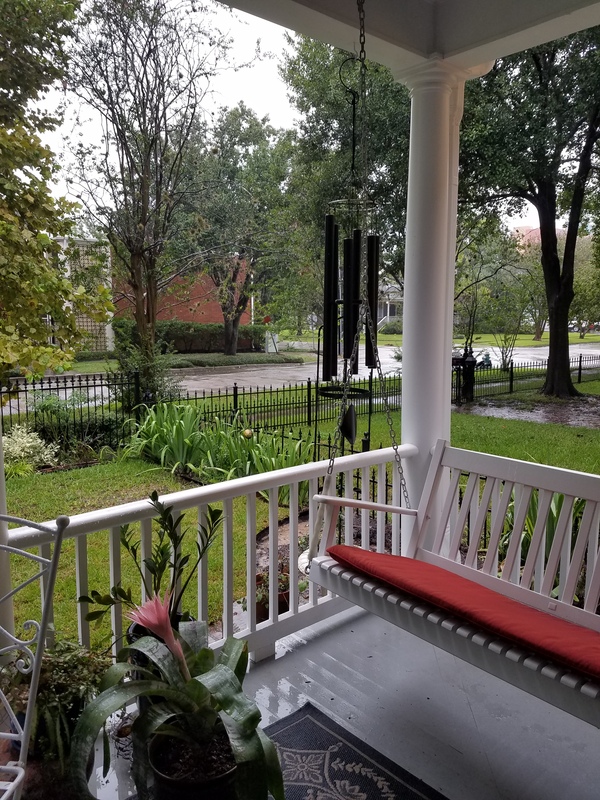 People think Texas and hot and dry…we are hot and wet! I so appreciated your FB updates and now this post. When you have people you care about in the eye of the storm, and yet are thousands of miles away, it’s such a helpless feeling. Sending warm, dry, thoughts for the days and weeks ahead! Thank you Loree! Wishing the PNW rain to put out the fires! Thanks for sharing the experience with photos that really bring it home, Laurin. Like you, we were glued to the TV and our phones, praying that our friends and family wouldn’t lose their homes. I’m so glad that your house proved a safe haven. I know Houston has a long road ahead, but with such a great spirit and generosity coming from all sides, I know it will be OK. Thank you Pam thank you for staying in touch during the high water. It will be a long road! I do think sharing the journey has pulled us on the gulf coast together. 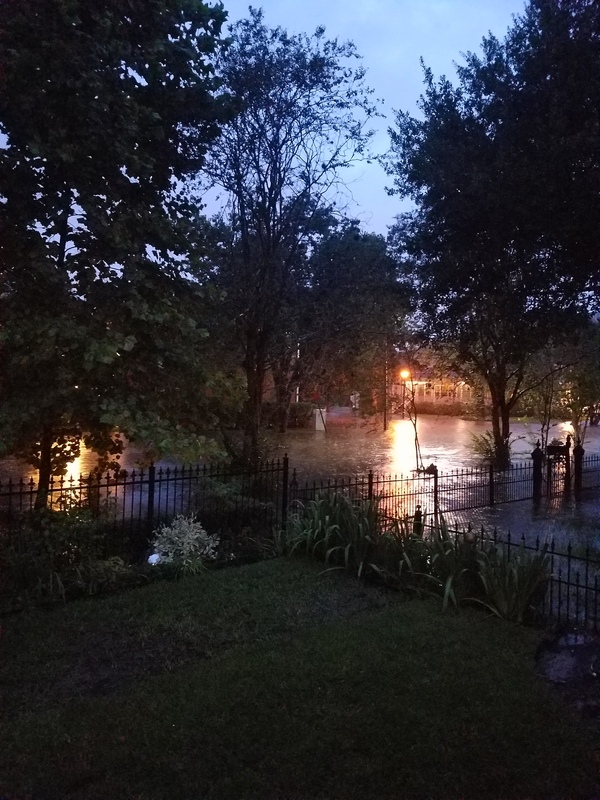 Even those of us who have watched from afar have been amazed at the amount of rain, destruction, and continued caring for our fellow humans. Texas has shown the rest of the Country how to survive a catastrophe with your head held high. Now, we all wish you the strength and tools to bring your homes and businesses back. Thoughts and prayers for a timely recovery. Thank you Judy! It will be a lot of work but we will get there, helping those all around us until we do! Stay strong and I hope this is the end of it for a while so you can settle back and create a new normal. Sometimes you need a wakeup like this to see just how good the hearts of your neighbors are even when you often disagree. Houston attracts people that are looking for affordable place to live their lives and raise their families. These are salt of the earth type people and this shared experience reminds us of the good in people! So glad you are safe, but also happy to hear you came out of the experience feeling better about your community. Thank you! It has been a few weeks and slowly as we move towards normal the fact that it will never be the same sinks in!